This is a bitcoin-friendly casino with an extensive assortment of games from 15 providers, a great bonus system with many kinds of bonus deals for new-comers and regulars, and a nice destination for devotees of pokie tournaments. Australian gamblers pass quick registration procedures, deposit 30 AUD and automatically receive a groovy welcome bonus and many other goodies thereafter. New users are not requested to sign up and deposit before playing because all the gaming content is readily available in two modes: for fun credits and real money. If you want to derive real-money profits, you’d rather create an account and fund it with AUD or other currency. The methods listed on the casino’s payment page are VISA, MasterCard, a couple of electronic wallets and five cryptocurrencies such as Bitcoin, Ethereum, Litecoin, Bitcoin Cash and Dogecoin. As is said in the first paragraph, a player cannot deposit less than 30 AUD or currency equivalent ($20, 0.003 BTC, etc.). Cashout possibilities are fewer and the limits applied by the casino are 30 AUD (the minimum amount), 3750 AUD (the maximum weekly limit) and 18,000 AUD (the max monthly limit). Winnings from progressive pokies are paid out in a lump sum. Methods for cashing out money include credit cards, cryptocurrency and bank transfer. The casino currently features a few hundred of pokies from famous vendors such as Belatra, BGaming, Booming Games, Betsoft, Evoplay, Habanero and iSoftBet. 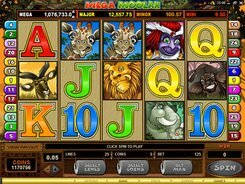 Pokies are located in a separate “Slots” section with only one filtering option available on the page – a player can narrow down the list by picking a preferred game provider. If a pokie icon is hovered, the player can see two options of how to play the game: for fun or for real money. The pokie collection is comprehensive and takes into account the diversity of tastes and preferences that gamblers have. On the “Slots” page you will find many mainstream five-reelers as well as time-honored classic games with 3 reels. Progressive games are singled out on a dedicated page. 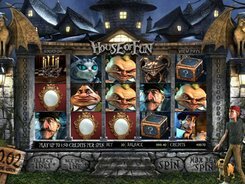 Small-sized game icons in the casino lobby show real-time values for most progressive pokies, with around 50 of them currently on offer, including Faerie Spells, Greedy Goblins, Rambo, Reels of Wealth and Tycoons. Interestingly, nearly all progressive are also playable for fun. The “Card games” page in the casino covers the whole spectrum of popular online games that one can imagine, except for table games like roulette, dice, scratch cards and some other game types, which can be found on the “All Games” page. Anyway, players will enjoy 50+ blackjack variants (Blackjack Surrender, Super 7 Blackjack, Single-Deck Blackjack, Double Exposure 3-Hand Blackjack) and many roulette solutions (European, American and French roulette games). The live casino lobby presents 40+ tables from Evolution and Vivo Gaming. Based upon the number of titles displayed in the casino, the live casino lobby contains the better part of the collections from the said developers. Live dealer games cannot be played for fun but are available to registered users only. 100% match up to 150 AUD plus 50 free spins. When betting on pokies while a bonus is active, the casino deducts money from your cash balance first and then from your bonus balance. A bet limitation during bonus wagering is 7 AUD. Each Monday, players can make use of a 40% up to 150 AUD reload bonus. Rules for the reload bonus are exactly the same as for any of the welcome bonuses in Joo Casino, including a qualifying sum of 30 AUD to be eligible for the reload offer. You can claim up to 50 free spins on Wednesday. The maximum amount from free spin winnings may not exceed 150 AUD. Tournaments normally run one after another, one event at any given time, and last for 1 to 2 weeks. For each tourney, the casino picks a long list of games that bring tourney points for participating players. The principle is fairly standard and is used in many other casinos: Players get a certain number of points for each real-money wagered on qualifying games. In Joo Casino, a player receives 1 CP for every 1 EUR bet. The leaderboard usually contains 20 winning positions, with top three players being awarded 50 to 500 EUR each. Is the casino worth giving a try? In spite of an ordinary visual design style, the online casino has some undisputed benefits over competition: an excellent suite of games, proven reliability and good bonuses. The online casino receives some very good feedback on online communities of gamblers and is well trusted by many Aussies.